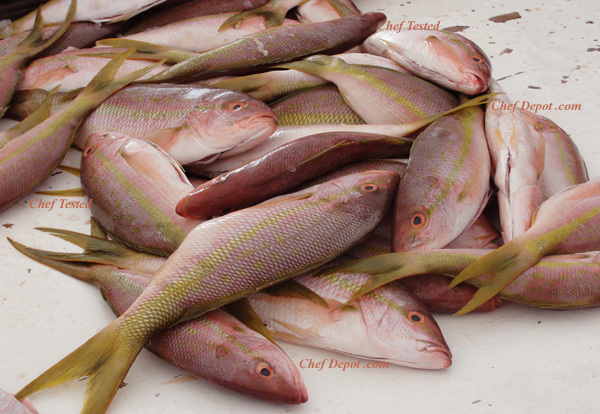 The Chefs Fish & Game Recipes ! Heres a few of the Chefs personal favorites! EVERY ITEM WE SELL IS TESTED BY CERTIFIED CHEFS FOR QUALITY AND VALUE.... CLICK THE PICTURES BELOW! TELL YOUR FRIENDS ABOUT THIS WEBSITE!! The following recipes are Professional Chef Recipes! The recipes are copyrighted by "Chef Depot" Inc. Please visit our PRODUCTS area for the highest quality cutlery and Chef tools at the lowest prices! Check out our forged Knife Sale - Click Here and the Custom Butchering Sets - Click Here Also take a look at the Chef Depot Spices & Cajun Blends, and our dried Wild Mushrooms & Vanilla to enhance your wild game cooking! Chef is using his favorite burger press. Click here to buy a burger press and other game processing tools. And a great Roasted Garlic recipe, click here. Enjoy fresh roasted garlic with your next meal. Click Here for the featured Kyocera Ceramic Knife! Notice the Chef is using one of our NSF Maple Cutting Boards! Pro butchers use our boning knives ~ click knife, on sale now. Pro guides love our fillet knives ~ click knife, on sale now. The greatest Jerky Machine on this planet! Click Here! 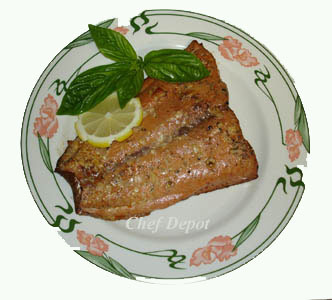 Chef is preparing a great salmon dinner recipe. Click here to buy his slicing knife! Notice the Chef is using one of our big Maple Cutting Boards! These are rated #1, made in USA. This is a nice Black Crappie. Click on the fish to locate fishing spots and states Fish & Game sites within your area. Catch a bunch ! For a fast job of cleaning these, you better have a sharp knife as pictured above!